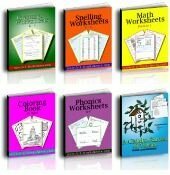 There are eighteen third grade printable exponent worksheets on this page. These teach raising a base number to different powers like the squares and cubes from different perspectives. You can teach kids to memorize the squares and cubes, to learn the powers of ten as a base, and how to simplify exponents. Start using exponents with squares. Move to finding the square roots - a very similar exercise. Square roots exponents with exponent charts. 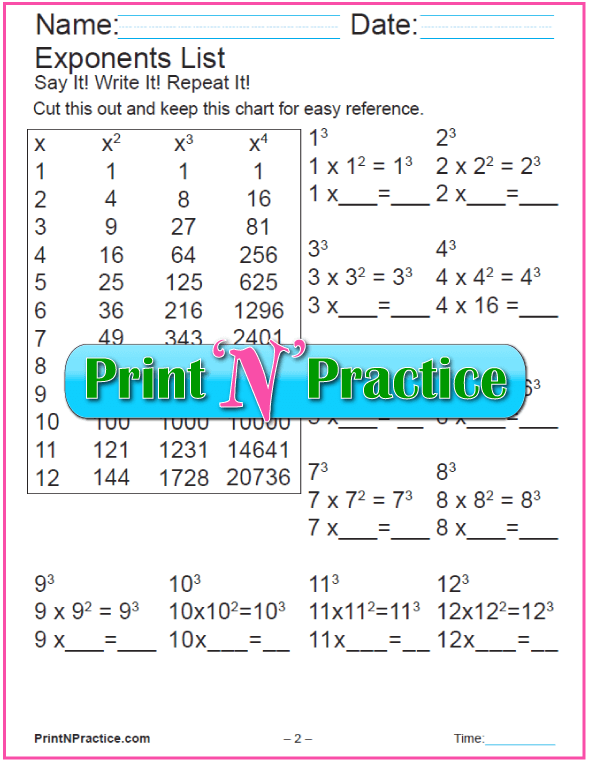 Cube exponent worksheets with exponent charts. 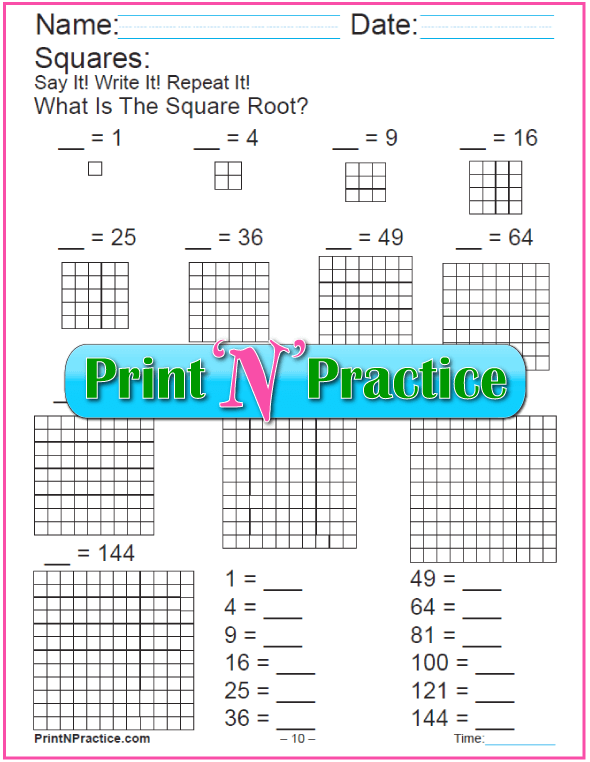 These exponent worksheets introduce the visual element of the square of a number which is the basis of learning square roots. Learning the squares is also the basis for how to figure square footage - simply multiply - the simplest math area formula. 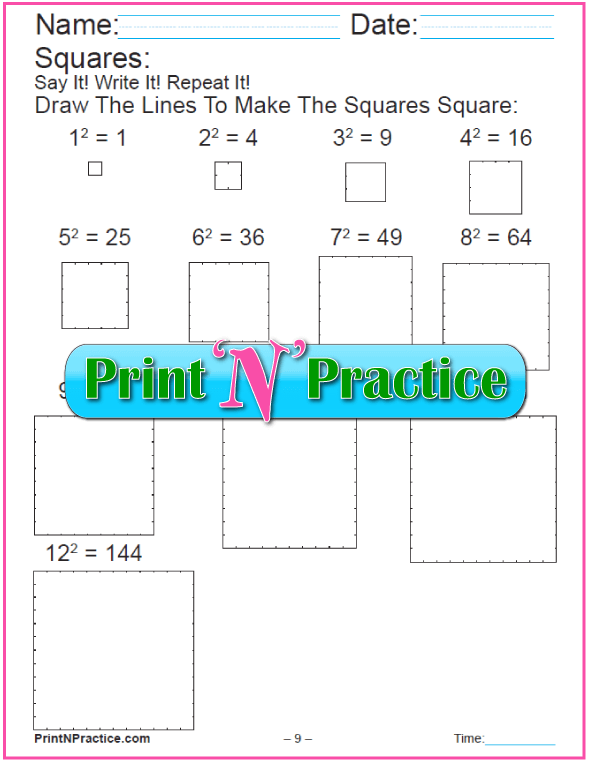 Use this first worksheet for memory work to memorize the square exponents and use the two on the right as quizzes. The bottom left exponent activity is way too difficult for some children to draw the lines, yet trying the first few can help them comprehend making a number square. 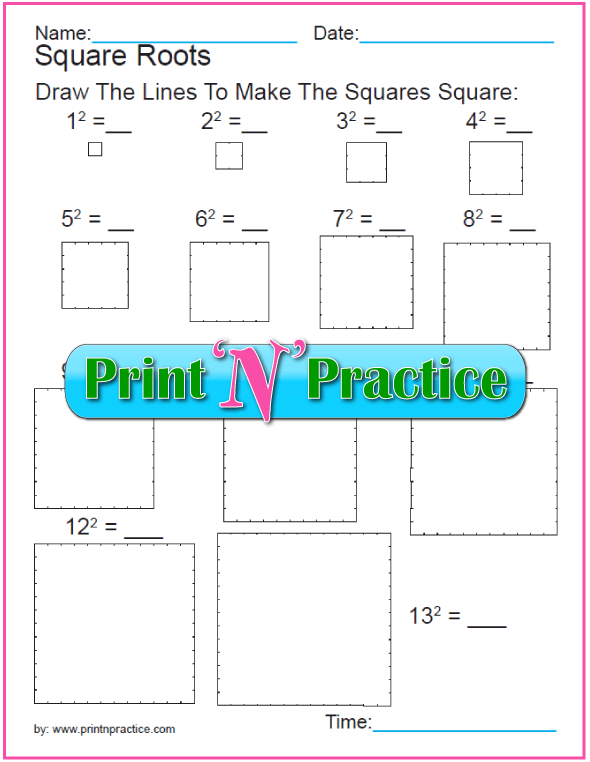 This is the page to use while teaching the children to memorize the squares. This page has the answer missing for an easy practice quiz. Use this page when older kids do not comprehend. It's actually quite a large project, so allow plenty of time. I wouldn't use this with small children. Use this page to show the relation between squares and the square roots. Ask "What squared equals one? What squared equals four? It's really a matter of asking the equation differently. You can use these worksheets with Crewton Ramone's excellent explanatory videos. See one as well as a link to his site at the bottom of this page. He has worked for over twenty years as a professional Math tutor, and has put his successful tutoring videos online. 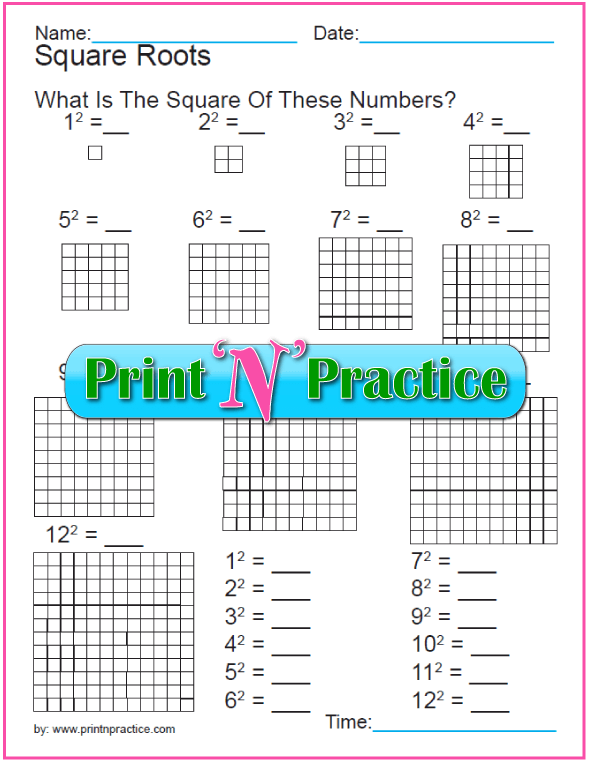 See his video below our printables for easy ways to teach square numbers. Having a squares chart seems to be the only real square root formula. If you memorize the squares (the doubles in multiplication) you'll recognize the factors when you are asked for the roots and you'll know most of the squares table for the lower grades. These worksheets can be skipped if your kids understand that roots undo the square equation. Have you tried finding an exponent chart? Need a square root table? They can be hard to find, so we have made one for you to use as a Math Poster or to put in your binder. We've also made handy little cards to cut and share. The formula for roots is the same as the formula of a square, or the area of a square; yet in reverse like difiding. Using an exponents chart makes these easy to see. REMEMBER that, when working in reverse from square to root, the answer can be negative or positive. The area of a square uses the same Math facts as the formula for making a square. Squares are numbers multiplied to the second power. Cubes are numbers multiplied to the third power. Use these exponents worksheets to practice the multiplication facts necessary to find the squares and cubes. Cube worksheets are below and use the same chart as these square worksheets. 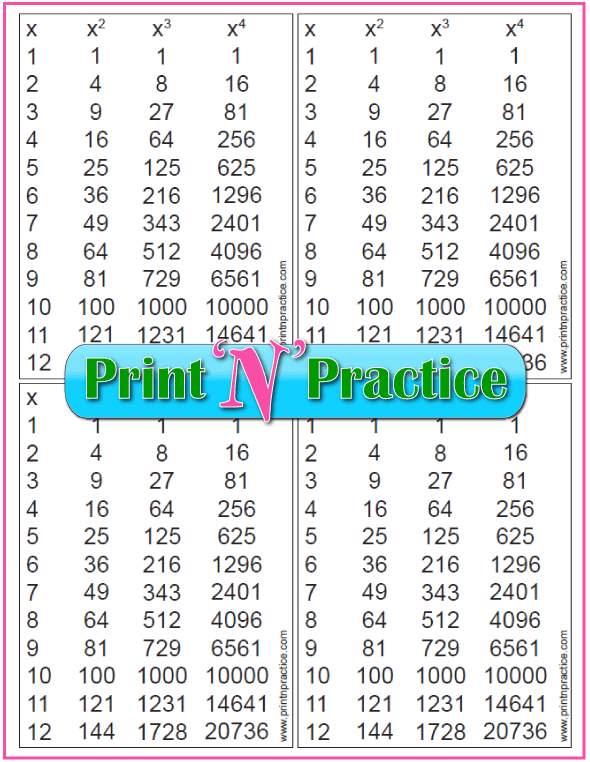 The printable exponent chart on the right has four of the one on the left and can be cut to use as a bookmark in a math book or kept in a desk, binder, or taped in the math text. 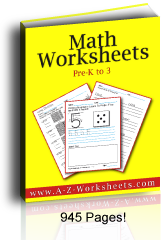 These first two worksheets are great practice because the equation is right on the page. The first practice worksheet shows how to get from squares to cubes with the squares already figured. The second worksheet has blanks to figure the squares. When you square a number the second number is the same as the first. Again, practice the equation which can be copied from the equations on the page. These worksheets spell out the square and cube relationships directly. The first practice worksheet shows how to get from squares to cubes with the squares already written. The second worksheet has blanks to figure both the squares and the cubes. 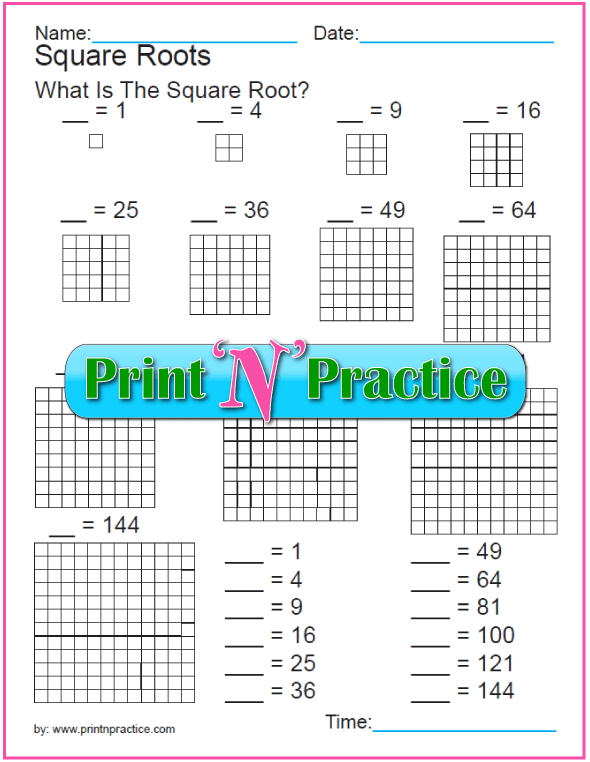 These two printable exponent worksheets can help a child visualize the words that we use to talk about the cube roots. Use the square root table above to find the cube root since both are on the table. A cube's volume is simply the height times the width times the base sides. If the cube is a square cube, the sides are all equal and when multiplied give the volume of a cube. It is a giant help to show young children what a cube looks like with Math manipulatives or a Rubics cube. 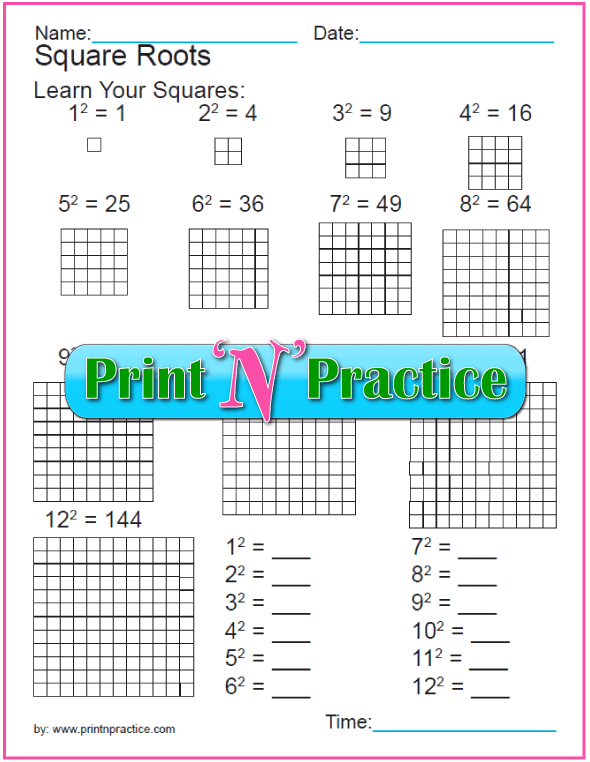 Use these exponent worksheets for square cubes. Also teach that the real exponent for the first number is 1, so the exponents add up to 3 for cubes: 1+2=3. First, make certain that your students are relatively handy with multiplication and division. The better your students know their math facts, the easier it will be for them to learn exponents. If your students aren't handy and need practice, use our fun multiplication worksheets, then come back to this page. Exponents are simply multiplication, and square roots are tricky division. It helps to have a chart for the roots which is why we include the charts in the worksheets above. Exponents come second in the order of operations for Pre-Algebra. Use this phrase to remember the order: "Please excuse my dear Aunt Sara." or use the phrase PEMDAS and pronounce it as a word, Pemdas. Negative exponents mean the reciprocal of the base raised to the power of the exponent. They wind up being fractions or division. 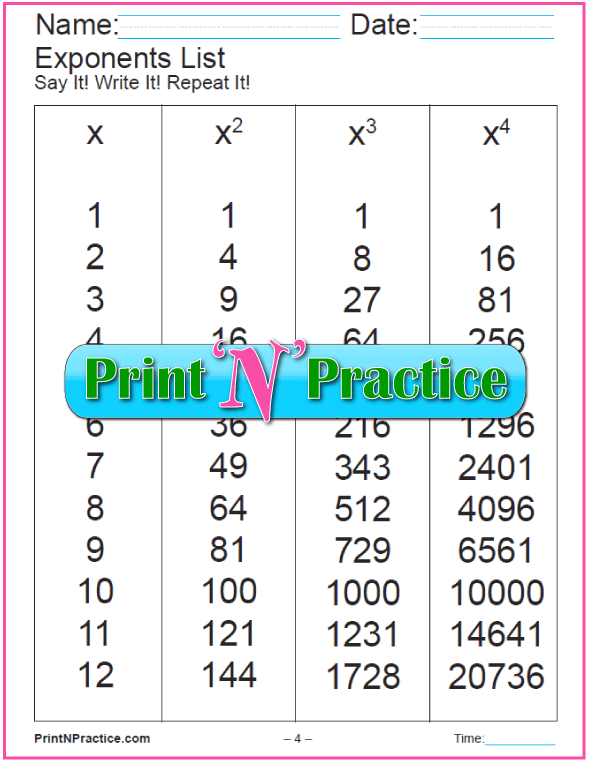 Practice is necessary to gain speed using exponents. Knowing how to use and find exponents well makes learning math and science so much easier! See our Order of Operations Worksheets to offer practice using PEMDAS. You might also like our handy geometry formula sheet. See more excellent videos on Square Numbers at Crewton Ramone's House Of Math square numbers. He's one tutor that's got a wonderful talent for teaching Math. Sign up for his Password to see more info. The exponent tells how many times to multiply the number. If the exponent is 0 the simplified answer is 1. Negative exponents are signs for dividing. MathsIsFun has a great explanation of the laws of exponents. 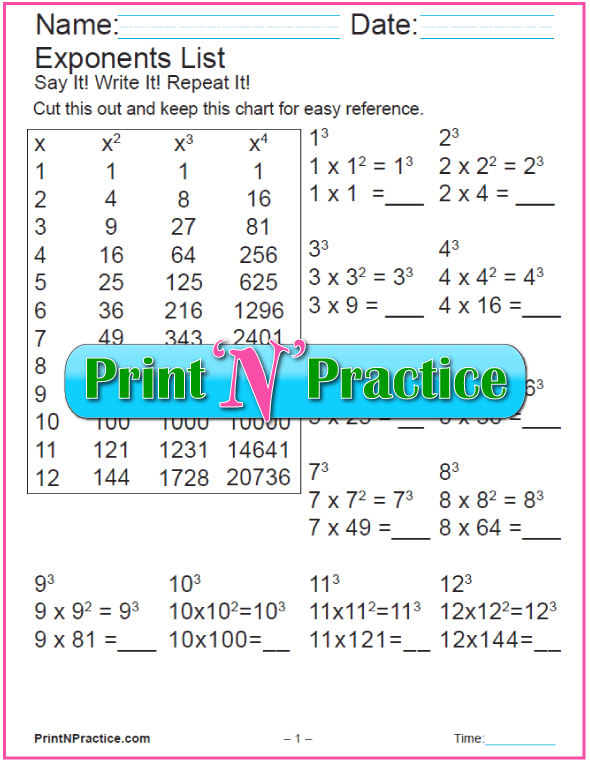 Thank you for visiting our printable exponent worksheets!